Infiniti is one of a growing number of car brands exploring new technology tools for dealers in showrooms, hoping to better engage younger consumers. One of the Japanese carmaker's latest programs is an augmented reality app that enables customers to see the inner workings of a vehicle while viewing a car in the dealership. The X-Ray Visualizer was developed in partnership with Visionaries 777, a software developer, which the company started working with in 2016. Powered by a Unity Technologies platform, the app essentially aims to replace the traditional pamphlet with a more practical tool, while keeping the most important factor of the retail experience intact: the interaction between the customer and the salesperson. 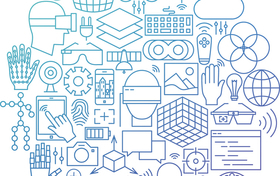 "We've seen a lot of hype around virtual reality. Everyone is talking about it, but when you really think about it and really try to use it in a dealer environment, it's really quite complex," said Frantz Lasorne, one of the co-founders of Visionaries 777, which is focused on developing augmented reality and virtual reality consumer sales tools for Infiniti. "You have a hundred problems, you have logistics, you need to take customers one by one, and you kind of lose the human factor, because once you put the goggles on, then you don't see the salesperson anymore." David Castaneda, another one of Visionaries' co-founders, said the X-Ray Visualizer is an example of why it is important to have the dealer network engaged in the development process. The tool is one of three app sales tools the company has developed for Nissan's Infiniti brand. Visionaries 777 meets weekly with Infiniti to assess how the sales tools are working or how the tools could be improved. "Our job is to make sure we understand their immediate needs and sometimes problems," said Castaneda. "It's always a balance. Many of the programs come from just Infiniti speaking to the dealer network and then them speaking to us and communicating to all of us how we come up with solutions for these problems." Matt Wilson, Infiniti's director of global client experience and training, said the goal of any of the carmaker's technology sales tools is to make things easier for customers. "There's a lot of trepidation, often times, from consumers in the car buying process, and we want to take a lot of those pain points, and either eliminate them or minimize them," he said. 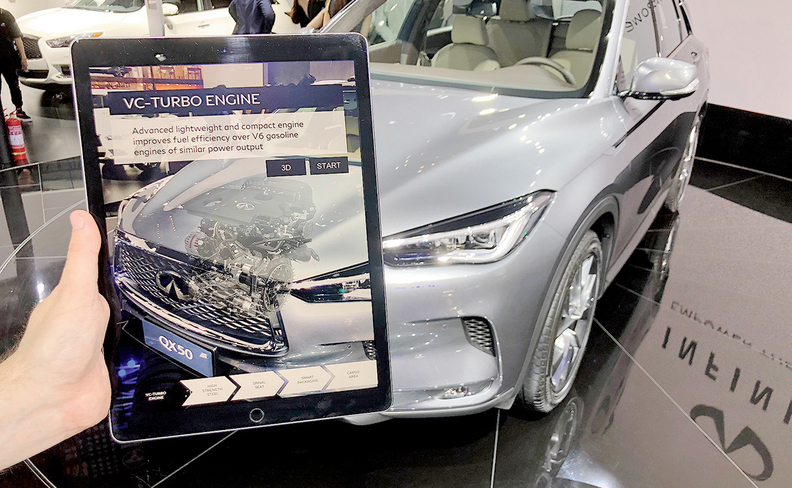 Using an augmented reality app called the X-Ray Visualizer, a customer can see the inner workings of an Infiniti QX50. Infiniti's most widely used customer and dealer app-based sales tool in the U.S. is ICAR-X, which also features a service application leveraged with the client. The technology program, introduced in 2015, focuses on streamlining the car-buying process, from the initial shopping for a vehicle all the way to reviewing a VIN-specific delivery checklist, using the ICAR-X app. The co-founders of Visionaries 777 said it's important to have a holistic approach to the development of any sales technology tools. "The strategy is divided into sections. The first one is, can we create digital tools that help us attract the customer's attention, let's say on the website?" said Castaneda. "Our job then is to make sure we drive people into the showroom. Then it's how do we empower the salespeople to do a better job at communicating or explaining the new tech?" Castaneda said the Hong Kong-based company also works with Infiniti to make sure the brand messaging for the tool is cohesive and connected on a local, national and global level. "Whether it's in China, in the U.S. or in Europe, you like for everyone to be speaking the same language in terms of technicality," he said. The goal, Wilson said, is to make sure that the technology doesn't negate the human factor. "Customers still want to be able to touch and feel the vehicle. They may be doing significantly more research online, then showing up to the dealership to do it," said Wilson. "But at the end of the day, when they're looking to make that final investment into a vehicle, they still want to be able to touch, feel and drive that car and feel like they got a retailer that's going to take care of their needs if something goes wrong."